A few companies in India are leading the way in bringing women back to work. At JobsForHer, we salute these companies and hope that they inspire other companies to do the same, the way they inspire us! We've forged some fantastic partnerships with some of these companies, working with them to design and implement re-entry programs for women who want to get back to work. All of these companies have benefited exponentially from this endeavour, and we hope these stories inspire other companies to open their doors and welcome this fantastic talent pool back to work. 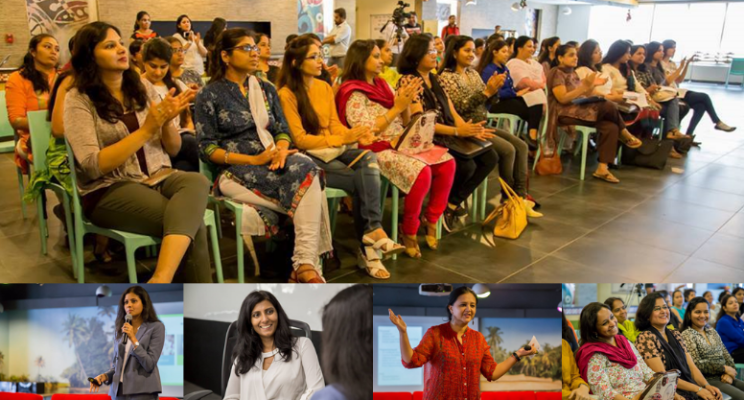 InMobi recently partnered with JobsForHer to co-host an exclusive workshop for women on a career break, with some of the biggest movers and shakers of the corporate world coming forward to be a part of the movement to bring women back to work. Part of InMobi’s #SheIsBack campaign focussed on helping women jump back into the workforce, the workshop saw senior leaders from Amazon, GE, Philips, InMobi Technology, and JobsForHer come together to mentor women who want to get back to work, giving invaluable advice on how to deal with the varied challenges that come with taking a career break. Women had the opportunity to meet and network with industry experts and InMobi’s leadership team, and learn from the invaluable tips and insights shared in the sessions. They came out stronger, more confident, and determined to get back to work. JobsForHer launched a one-of-a-kind campaign called #BringHerBack in October 2016, in partnership with a 100-year old IT giant to bring more women back to the technology sector in India. We brought on board TalentBridge, a career assessment firm that assessed every applicant’s individual strengths based on the jobs on offer, through online skill tests. Applicants shortlisted by TalentBridge were then retrained in the necessary skills through courses offered by SimpliLearn, our BringHerBack retraining partner. The retraining process was tailored to the technology jobs on offer, so that women could hit the ground running when they restart work. Several industry leaders came forward to engage with our talent pool of women returnees to answer their questions and provide guidance on how to restart their careers. We’ve featured expert chats from Genpact on their Career 2.0 program as well as LXL Ideas and LinkedIn and Mindtree. JobsForHer and Pink Lemonade organized a Work-Readiness workshop, a half-day program created for women on a career break to understand the working of an advertising agency. Pink Lemonade offered volunteering opportunities to the women attendees in design, administration and creative roles within the agency. Volunteering gave women returnees the chance to dip their toes in the water and get a feel of working on a team and towards deadlines. “We cultivate an environment that nurtures and allows women to grow, and be happy and fulfilled. I want to nurture a happy environment. At Pink Lemonade, we’ve inculcated a culture that’s extremely invested in everyone's happiness, where people feel completely empowered. They will do the best for the place where they feel they belong, which is here, at Pink Lemonade. They will derive immense satisfaction from the work they do for a place they love. In general, women are creative by nature – it takes immense creativity to set up a house, cook a meal every day, host guests, raise children and nurture a marriage. So, to me, giving women a chance in the creative industry is a no-brainer. Our team has grown extremely fast and it has done so creatively. Our women to men ratio, right now is 3:1,” says Tina Garg, founder of Pink Lemonade. This one-of-a-kind event gave women looking to restart their careers a chance to be mentored by experts and senior leaders from various industries. The idea was to provide aspiring women returnees with a platform where they could learn from others who had done it. Mentors from companies like Capgemini, EY, McKinsey, Mindtree, Google, GE Capital and Barclays came forward to provide inspiration and ideas for a second career. The Mentoring Roadshow featured Group Speed Mentoring sessions, where each mentor had a group of 5 mentees at the same table to discuss their career goals and aspirations. After 20 minutes, the mentees changed tables and found themselves with a new set of mentees. This round-table speed mentoring format lasted for 60 - 90 minutes, keeping the conversations short, crisp and highly customized. As 2016 draws to a close, we look back with pride and a renewed passion to reach even greater heights in the coming year. It is this sort of energy, outlined in these inspiring stories of change that we hope other companies will catch on to, in the ongoing movement to bring more women back to work in India. The evidence speaks for itself - improving on your company’s diversity quotient benefits women and the company’s bottom line. So sign your company up on JobsForHer TODAY and gain access to this incredible talent pool of experienced, qualified women returnees, available at no notice period! We can also work with you to brand your company as a women-friendly organisation and engage with this talent pool beyond just recruitment. So what are you waiting for? Write to kirthi@jobsforher.com to learn how we can get started!